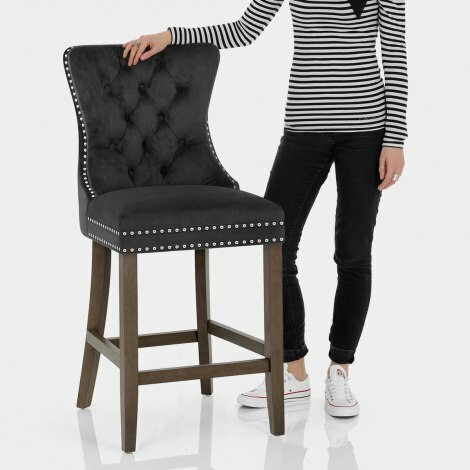 Live like royalty with the Kensington Wooden Stool Black Velvet, a majestic item with a delightful decorative style. A fixed design with traditional sophistication and regal flair, the Kensington Wooden Stool will impart a sense of magnificence to your interior. The sumptuous seat offers supreme comfort with a belted frame and dense padding. Black velvet upholstery radiates elegance and is enhanced by magnificent chrome stud edging on the seat and backrest. Quilted buttons detail the centre of the backrest, which has a high shapely design for grand effect, whilst the rear features an ornate chrome ring. Four slender tapered legs unite to create a robust frame and exhibit chic rustic style with a dark wood finish. Suitably fixed at kitchen worktop height, the frame also has a bracing bar footrest that works to keep your feet supported. Complete with protective underside plugs, your home will get the royal treatment with the Kensington. "Very elegant and beautifully made thank you"
After a lot of back and fourth trying to decide which stool to go for, I finally went for the black velvet Kensington.... And I am so pleased I did! They are well made, comfortable and complement my kitchen lovely. Absolutely love them!!!! Thank you Atlantic! It was a excellent choice I love the look of it very elegant and beautifully made thank you.